At least 44 people were killed and scores injured today in a bomb attack and cross-firing during a Muharram procession in southwestern Pakistani city of Quetta in sectarian violence, prompting authorities to clamp curfew and deploy the army to quell rioting. 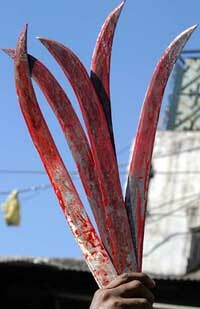 A Pakistani Shi'ite Muslim holds knifes he used to beat himself during an Ashura procession in Rawalpindi on Tuesday. ELEVEN International Society for Krishna Consciousness (ISKCON) temples and organisations filed a Chapter 11 reorganisation plan in the US Bankruptcy Court on Monday. With its growing financial strength, India is vulnerable to money-laundering activities even though the country’s strict foreign exchange laws make it difficult for criminals to launder money, the US State Department has said. In a dramatic day of testimony at the Kanishka trial, an associate of key accused Ajaib Singh Bagri told the court that Bagri confessed to his involvement in the 1985 Air India bombing that killed 331 persons. A European rocket blasted off today on a pioneering 10-year journey to land a probe on a comet and search for clues to the solar system’s origins. 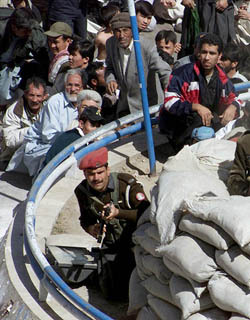 Pakistan Shia mourners take cover behind a para-military bunker after an attack on an Ashura procession in Baluchistan’s provincial city of Quetta on Tuesday. Unidentified people exploded a bomb and opened fire on the procession by minority Shia community killing 29 people and injuring several others, some of them seriously, reports reaching here said. Abdur Rahim Kakar, Mayor of Quetta, said indefinite curfew has been imposed in the city and the army deployed to restore law and order. 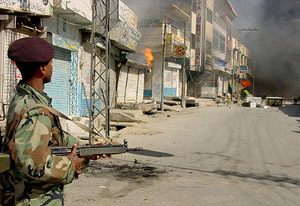 A Pakistani soldier watches burning shops set ablaze by angry Shi'ite mourners during curfew in Baluchistan's provincial city of Quetta on Tuesday. He said unidentified gunmen opened fire on the Shia procession as well as on security forces who in turn returned fire, leading to casualties. Local correspondents said a bomb exploded at busy Liaquat Bazar locality in the city centre, followed by firing. Following the incident, angry mob burnt several shops to protest the killings. The crowd also set ablaze office of Jang newspaper and its sister-concern Geo private television offices. Scores of injured have been brought to hospital. Some of them are stated to be in critical condition. Meanwhile, in another incident today, two people - one Shia and one Sunni - were killed and 40 injured in a clash between the two groups in Phalia in eastern Punjab province, about 135 kilometers east of capital Islamabad, reports said. ELEVEN International Society for Krishna Consciousness (ISKCON) temples and organisations filed a Chapter 11 reorganisation plan in the US Bankruptcy Court on Monday. This plan will oversee the distribution of financial compensation to devotees who were sexually abused at ISKCON temples across India and the United States. The plan provide for up to $15 million to be provided to ISKCON creditors, the majority of whom are former ISKCON students. The bankruptcy cases, originally filed in 2002, were in response to a lawsuit, alleging child abuse at Hare Krishna boarding schools. According to the suit, filed by former devotees in June 2000, these incidents took place in the ’70s and ’80s. Last year, 11 ISKCON temples put out legal notices in an effort to contact former devotees who may have been abused at ISKCON boarding schools. Krishna temples in Los Angeles, San Diego and West Virginia are among the organisations that filed for Chapter 11 protection. The reorganisation plan provides compensation for over 400 youth who never joined the suit against ISKCON temples. “We are providing assistance for any Krishna youth who may have been abused and who filed a claim with us — whether or not they sued — and we are increasing the available funds with voluntary contributions from independent temples around the world that want to help our youth,” Mr Liberman said. The claimants must yet approve the plan, and the Bankruptcy Court will make an independent judicial determination assessing the legality, adequacy and fairness of the plan within the next few months. In June 2000, 91 plaintiffs in Dallas, Texas, filed a $400-million lawsuit against the temples, accusing senior Hare Krishna leaders of sexual, physical and emotional torture. The suit alleged young Hare Krishna devotees were subjected to torture at boarding schools across the US and India for over two decades. It further claimed that although sexual, physical and emotional abuse had occurred in “almost every” ISKCON school, the worst and most widespread abuse was inflicted at gurukuls in Dallas, New Vrindaban, Los Angeles, Seattle, Washington, Port Royal and Lake Huntington. The US Federal Court dismissed the suit in September 2001, but the plaintiffs persisted and filed a fresh lawsuit in the Texas State Court in October 2001. ISKCON leaders say the damages sought in this suit are greater than the collective assets of the temples and individuals named in the suit, and would destroy their religious communities. “The suit threatens to close places of worship and punish innocent families that had nothing to do with these allegations,” ISKCON spokesperson Anuttama Dasa said at the time. ISKCON then filed for Chapter 11 protection. “Through Chapter 11, we hope to balance the ligitimate needs of any of our young people that may have been abused, while protecting the rights of our members and families to maintain a place of worship,” Anuttama Dasa added. The Krishna tradition in the US dates back to 1966 when ISKCON founder A.C. Bhaktivedanta Swami Prabhupada set up the first ISKCON society in New York City. In 1998, ISKCON established a child protection office to investigate allegations of abuse, provide grants for youth who may have been abused, and to ensure the protection of Krishna children. “Abuse of even a single child is a tragedy,” said Anuttama Dasa. India, along with Pakistan, figure in a list of 77 countries, large and small, developed and developing, which are of “primary concern” in terms of “major money-laundering” activities. “As a growing regional financial centre, India is vulnerable to money-laundering activities. Some common sources of illegal proceeds in India are narcotics trafficking, trade in illegal gems (particularly diamonds), smuggling, trafficking in persons, corruption, and income tax evasion”, the state department said in its International Narcotics Strategy report released yesterday. However, India’s historically strict foreign-exchange laws, transaction reporting requirements, and banking industry’s ‘know-your-customer’ policy made it difficult for criminals to use banks or other financial institutions to launder money, the report said. Rather, a large portions of illegal proceeds were laundered through the alternative remittance system, “hawala” or “hundi”, estimated to account for up to 30 per cent of India’s GNP, it said. Under this system, individuals transfer funds or other items of value from one country to another, often without the actual movement of currency. Historically, gold has been one of the most important instruments involved in Indian hawala transactions. There is a widespread cultural demand for gold in the region. In recent years, it is believed that the growing Indian diamond trade has also been increasingly important in providing countervaluation or a method of “balancing the books” in external hawala transactions, according to the annual report on the state of the war on drugs, terrorist financing and money-laundering. Invoice manipulation, for example, inaccurately reflecting the value of a good sold on the invoice, was also pervasive and used extensively to both avoid customs duties and taxes and launder illicit proceeds through trade-based money laundering, the report said. The report said that perhaps the largest source of money-laundering activity in India was income tax evasion. The Narcotic Drugs and Psychotropic Substances Act (NDPS) of 1985, as amended in 2000, calls for the tracing and forfeiture of assets that have been acquired through narcotics trafficking, and prohibits attempts to transfer and conceal those assets. “We did this,” Bagri had allegedly told the witness, a New York resident, when the latter met him at a gas station in New Jersey about two weeks after the bombing to express his fears about the crime being linked to him and his Sikh extremist organisation. The witness, whose identity is protected by a court order, said on the first day of his testimony that Bagri acknowledged his role in the bombing at least three times, a media report said today. “When I talked to him, he said ‘Why...(would it) bother you? : “And he smiled and said ‘we did this,” testified the man, who hails from the same village in Punjab as Bagri and described the accused as a “good friend”. The witness said he questioned Bagri about his role in Air India bombing a second time when they met at a Sikh convention in California in 1987. He said he asked why one bomb blew up while the plane was in the air and the other when it was on the ground and was told that they were expecting the first bomb in Narista, Japan to go off one hour earlier. The witness, who is an FBI informant, said he met Bagri at a gurdwara in December 1997 and asked him how they built the bombs. The Rosetta lander soared into the skies above South America atop an Ariane-5 rocket from Kourou, French Guiana. About two hours later, a 17-minute engine burn sent the spacecraft out of the earth’s gravitational pull and on its way to the comet. “We received the first communication from the spacecraft, which means the spacecraft is in good shape at the moment. Everything seems to be OK,” Gaele Winters, the European Space Agency’s director of operational and technical support, said at mission control in Darmstadt after the engine firing.